Pore Structure of Cement-Based Materials provides a thorough treatment of the experimental techniques used to characterize the pore structure of materials. The text presents the principles and practical applications of the techniques used, organized in an easy-to-follow and uncomplicated manner, providing the theoretical background, the way to analyze experimental data, and the factors affecting the results. The book is the single comprehensive source of the techniques most commonly used for pore structure analysis, covering simple techniques like mercury intrusion porosimetry and water absorption, to the more sophisticated small-angle scattering and nuclear magnetic resonance. 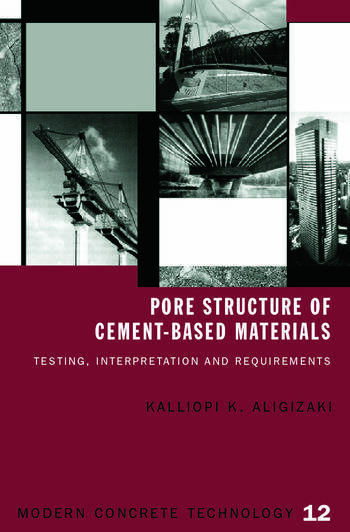 The book is an essential reference text for researchers, users, and students in materials science, applied physics, and civil engineering, who seek a deep understanding of the principles and limitations of the techniques used for pore structure analysis of cement-based materials. 1. Introduction. 2. Specimen Pretreatment. 3. Mercury Intrusion Porosimetry. 4. Gas Adsorption. 5. Pycnometry and Thermoporometry 6. Nuclear Magnetic Resonance. 7. Small-Angle Scattering. 8. Microscopic Techniques amd Stereology. 9. Comparison of Results by Various Methods. Kalliopi K. Aligizaki is a Research and Consulting Engineer at the Aedificat Institute Freiburg, Germany. She received her Ph.D. degree from The Pennsylvania State University, USA. Her research has focused on durability of building materials and parameters that affect reinforcement corrosion.